I finally had the time to watch the documentary, Exit through the Gift Shop; a feature focused on street art.I heard about this film whilst at grad school and through friends, but never got around to viewing it.I thought the title was brilliant and I believed the documentary to be about…well duh…the gift shops you have to go through once you exit the museum. I love gift shops and I cannot exit a museum without a visit to the gift shop. I usually buy noting more than a few post cards, magnets, or some other small trinket to remember my visit to the museum.Although I enjoy the gift shop experience, I do realize that, like the rest of the capitalist machine, the gift shops manipulate our wallets. You can’t take photographs in many museums and the chances are slim that you will ever see this art again.You want to remember this experience and gift shops prey on that sentiment.So no matter what the cost, we often find ourselves amongst other visitors in the ever so crowded gift shops! But I digress… as Exit through the Gift Shop wasn’t about gift shops at all. Rather, it was about street art. 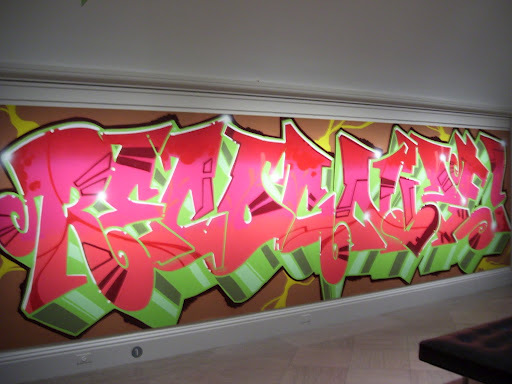 The documentary was shot by somewhat of a mad man who became obsessed with capturing street art to the point where he turned the gaze from the street artists onto himself; he took on the pseudonym, Mr. Brainwash and set out make a bigger name for himself than the artists he exposed before his rise in the movement. The most interesting aspect of the documentary was how street artists collate their art. For many, street art may appear as nothing but unplanned scribble.However, in many cases, the art is often planned out with care taken not only into the details of the art but also the location.Even more impressive is how these daredevils elude authorities and place their art in the most precarious places. What Mr. Brainwash was able to achieve in this film was to continue to pull the movement of street art into the mainstream.One of the featured artists in the film was Banksy, street arts comparative to Picasso – selling out art shows across the globe as well as commanding top dollar for his pieces at major auction houses. Since traveling in and living in Europe, I have paid special attention to street art: you cannot escape it. Even the most sacred monuments are decorated with street art.As street art is becoming more mainstream, the image of graffiti scrawled across NYC subway stations and in the most degenerate of neighborhoods is fading.This is not the graffiti of our childhood or our parent’s generation. No longer relegated to vanity tags, street art as a movement has progressed into a new mode of expression: one that informs, advocates, and inspires. A few weeks ago, I traveled to Valencia, Spain.Whilst there, I landed in the middle of a protest (which I blogged about previously) and what did I see? 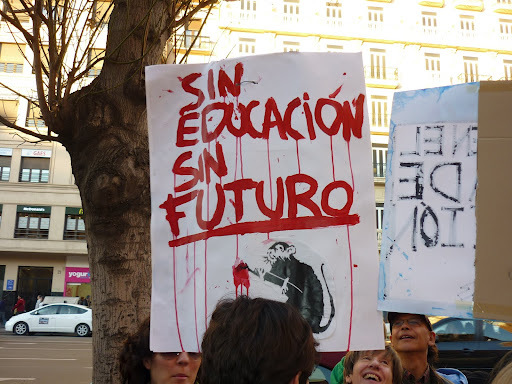 – An individual holding a sign about educational cuts with a Banksy picture on it.Street art is a mode of protest in itself and in this case been used in a protest movements. Street art simply is a movement within a movement. In Philadelphia, where I hail, street art has morphed into something to promote beauty and pride in neighborhoods.Battered neighborhoods have been adorned with giant murals espousing messages of hope and honoring some of Philadelphia’s greatest including the likes of Grover Washington, jr.In my teaching classes, I have been asking my students what their take on street art is. The reaction has been mixed. Some view it as vandalism whilst others view it as art and an expression of freedom. 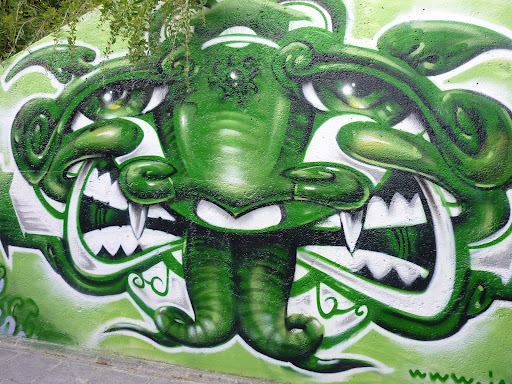 One student indicated that he never noticed any street art in Madrid. 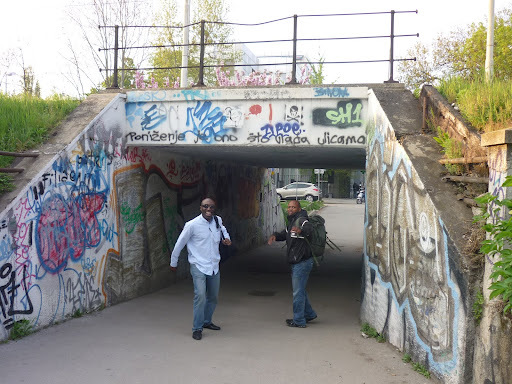 I was bewildered as I can’t go a few steps without seeing some semblance of street art – be it good or bad. Additionally I can’t miss the daily clean up efforts to remove the previous night’s tags. At times I do feel it to be destructive. I would hate to come out of my house and see someone’s signature on my wall. 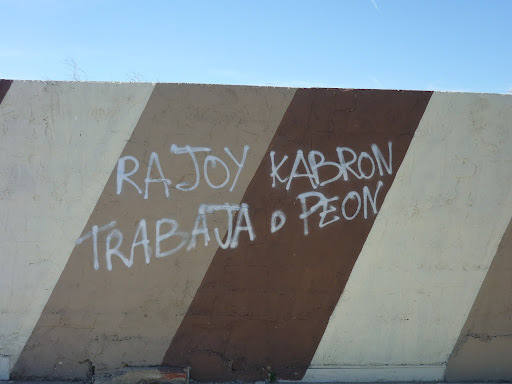 Although I value places like theBasílica del Sacré Cœur or the Parthenon, what better way to get people’s attention than to tag a public place? If we can congregate on public corners, why can’t we express ourselves on public buildings?For me, street art has come to stand for those people who live on the margins of societies – who may not be represented, who live in the shadows, and whose voices have been muffled. My student’s obliviousness to street art led me to one realization: street art has become so common and widespread that it has in fact become background to our existence. Just as the sound of the trains passing underground, the birds chirping in the morning, or the cars buzzing past our window.Personally, I cannot ignore it or simply pass it by.I have become a very scaled-down version of Mr. Brainwash and over the years I have captured various street art on my journeys from Croatia to Belgium and now Spain.Viewing street art in Spain allows me to understand the sentiments of the people.So when they say the streets are talking…they are literally talking! Check out some of my pictures from street art across Europe. Also, if you are in Philadelphia, be sure to take a trip on the Mural Arts Tour; one of the gems of Philadelphia.